Buzz-filled establishment changes its menu daily to take advantage of what’s fresh in season. : ONE. 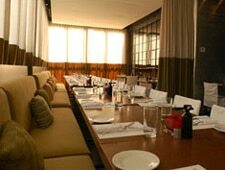 midtown kitchen is a contemporary space defined by a ceiling from which dangles a raft of lit pendants, like icicles. Over the course of its long and lively history, the place has oscillated from being edgy to familiar. Gone are dishes that made it a stand-out, such as innovative house-cured meats; though patrons will encounter such items as veal sweetbreads with broccoli, puffed rice and togarashi, a Japanese chili pepper. From the wood-burning oven comes a raft of Big Plates. Under this category you’ll find everything from classic pizzas (margherita) to a burger with Tillamook cheddar, pecan smoked bacon and American cheese. The wine list is divided into two categories, starting with One for All focused on the classic varietals. A second category is labeled One of a Kind and features the likes of Zweigelt and similar wine geek pleasers. House-made desserts include the longtime favorite pecan-crusted Kit Kat Bar. Note that there is a challenging noise level when the restaurant is full. Consider early or late visits if you wish to avoid the worst of the din.